There’s no love lost between Instagram and Snapchat, as Instagram product chief Kevin Weil found out the hard way. Weil has recently become the proud father of a pair of twins, and as doting father, often shares their pictures on his twitter. Yesterday, he shared a photo of his twins looking positively adorable. As a bit of a joke, he asked Twitter users to caption the picture. Weil had joined Instagram as its Head of Product last year, and is popular on Twitter, with nearly 70k followers. People soon began coming up with clever responses. Some used pop culture references. While others made cute baby jokes. One of Weil’s followers is Tom Conrad. 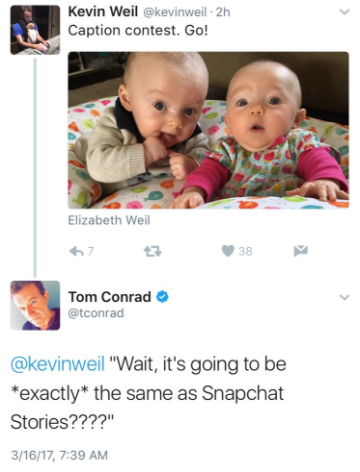 Conrad happens to be the President of Product at Instagram’s rival, Snapchat. He came up with this Zinger. “Wait, it’s going to be *exactly* the same as Snapchat Stories??? ?,” was Conrad’s caption for the look of surprise on the Weil twins’ faces. It wasn’t hard to figure out what he was referring to – Instagram has been accused of copying feature after feature from Snapchat. In particular, Instagram’s new Stories feature looks more than a little inspired by Snapchat Stories. What’s worse, Instagram’s parent Facebook has now also introduced the exact same feature on Whatsapp, and in a new development, seems to want to bring it to the Facebook app itself. And it’s not just Stories – at last count, Facebook appears to have adapted as many 15 features from Snapchat. People close to Snapchat have previously made their displeasure known about its larger competitor stealing its innovative ideas. CEO Evan Spiegel’s girlfriend Miranda Kerr has said that she’s “appalled” by Facebook’s actions, wondering “How do they sleep at night” with all their stealing. Infuriatingly for Snapchat, what Facebook is doing isn’t illegal. As long as Facebook doesn’t unless copy the underlying source code, or the exact way Snapchat’s features look, it can get away with building features that are very similar to Snapchat’s. It’s perhaps this peeve that prompted Conrad’s sardonic caption. While he’s since deleted the tweet, it stayed up long enough to get a reaction from some big names in the industry. Josh Elman, VC at Grelock Partners acknowledged the shade. And billionaire investor Chris Sacca tagged both product heads with this. Facebook might keep ripping off Snapchat, but social media is in no mood to give it a free pass.